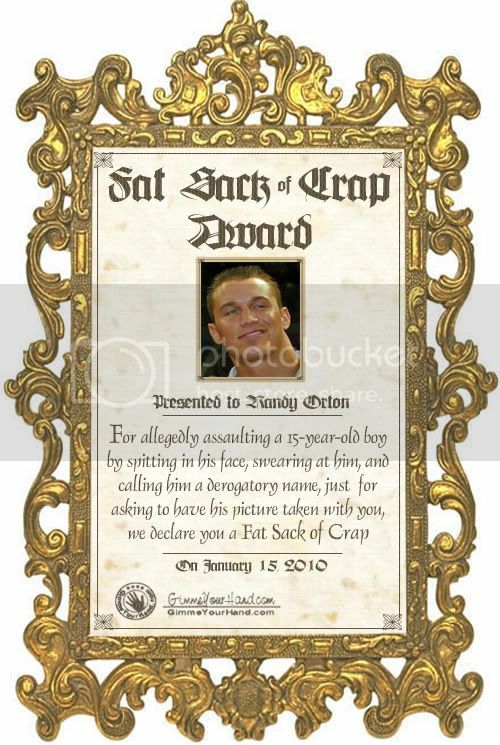 We here at Gimme Your Hand Entertainment are proud to present our first Fat Sack Of Crap Award to none other than Randy Orton! Randy has always been a top contender for this prestigious award, but what put him over the top are his actions that took place on January 8 of this year. On the night of January 8, Randy Orton allegedly assaulted a 15 year old boy outside Kowloon Restaurant in Saugus, MA. It was reported that the 6'4", 245-pound Orton cursed at, spit his gum on, and called a young teenage boy a derogatory name. What caused Orton to lash out with such rage? The boy asked for a picture with him. The mother of the boy says when she confronted the former WWE Champion, he simply replied, "so sue me". A hearing request was filed against Orton on charges of simple assault and battery. Whether or not Randy Orton will be held accountable in this altercation has not yet been determined. 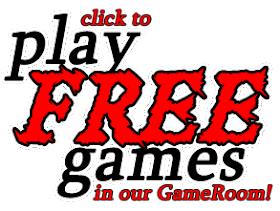 But you can rest assured that GimmeYourHand.com will voice our opinion. Given the background of anger issues, such as trashing hotel rooms, verbal and physical assault, and being a genuine, full-of-himself piece of garbage, Gimme Your Hand Entertainment proudly presents this award. If ever there was a more fitting recipient, you would be hard pressed to find him. To WWE: You need to step in and take action. Sitting idly by while your "Superstars" have displayed self-destructive behavior has not worked out well in the past. To Randy Orton: Get some counseling. If not, it's just a matter of time before things end very, very badly.